Click picture to see full size image. I became serious about photography through doing a 365 project in 2011. I got my first DSLR camera for Christmas that year and have been happily obsessed ever since. At the end of 2014 I had a eureka moment: abstract photography was for me. It’s ideal for depicting what moves me most in my world – the aesthetics of the characteristics of things. Abstract photography’s exciting, exasperating, exhausting and exhilarating. I love it. I hope you will too. Abstraction is intensely personal and one of the most imprecise art forms. There are no recommended settings or specific lenses that will produce an ‘ideal result’. The accepted ‘rules’ of composition are often deliberately broken or disregarded. There’s no magic formula that will guarantee success. This article aims to provide you with thoughts, ideas and suggestions, along with information about how I work. These may help you to make an abstract image or gain experience to make many of them. I began my journey by researching exactly what is meant by ‘abstract’. I didn’t find a universally accepted definition. The definition of abstract photography in the Photokonnexion glossary hits the spot for me. It is easy to understand and includes a list of the different aspects of abstraction. It makes a great reference guide for use in the field. I re-read it occasionally for revision. When I think about an abstraction, what I see in front of me is not manifested in my mind’s eye. Well, not as a picture. I don’t ‘see’ – I experience. Things come to me as impressions with verbal descriptions. I have recently learned that when people say they ‘see’, it’s not shorthand for a thought process that’s like mine. They really do make pictures in their heads. I first thought we all imagine in the same way. It seems that is not true. ‘Seeing’ an abstract is an intensely personal thing. You have to do it your own way. Studying, analysing and commenting other people’s work teaches you a lot. So, I researched the idea of the ‘abstract image’ on the internet. I viewed many abstracts, examining their composition. I had fun, gained insight into what abstracts can look like and developed ideas and personal preferences too. I began habitually looking everywhere for shapes, structures, patterns, lines and textures. I looked for them whether I was taking photos or going about daily life. Then it was time to put what I’d learned into practice. Look at items in your house. The kitchen is a great source of inspiration. Is there a type of photography you are especially enthusiastic about? Architecture: plenty of lines, shapes and patterns, often textures too. Street scenes (people and/or transport) have many abstract sides. Wildlife and fast-action sports photography lend themselves to expressing movement through abstraction. Macro photography shares an emphasis on detail so it too lends itself to abstract image work. Keeping an open mind and expecting to find a promising subject is a good recipe for success. The more you look for subjects, the more you will see, sometimes in unlikely places. Whatever you choose, it is important it moves you in some way. A way that makes you care about it. I spotted this chair stack in an out-of-the-way corner of an historic cathedral. Their lines caught my eye. I felt they had a rhythmic quality. Breaking the pattern, a compositional device often used to focus the eye, wasn’t appropriate here. The rhythm – the whole point of the image – would have been lost. Once you find something meaningful to you, examine it closely from all angles. You are looking for a way to portray it. What do I feel about this? What visual aspects – lines, shape, texture, etc – make me feel that way? How can I present, compose, those aspects to engage viewers and tell them what I saw? Look carefully. Allow the answers to those questions, and any other ideas that might occur, time to form in your mind. For the best results, keep these answers and ideas in mind at all stages of making an image. I study a subject via the camera’s viewfinder to remove distractions from the periphery of my vision. I often take photos at this stage too; the act of pressing the shutter button helps me think. 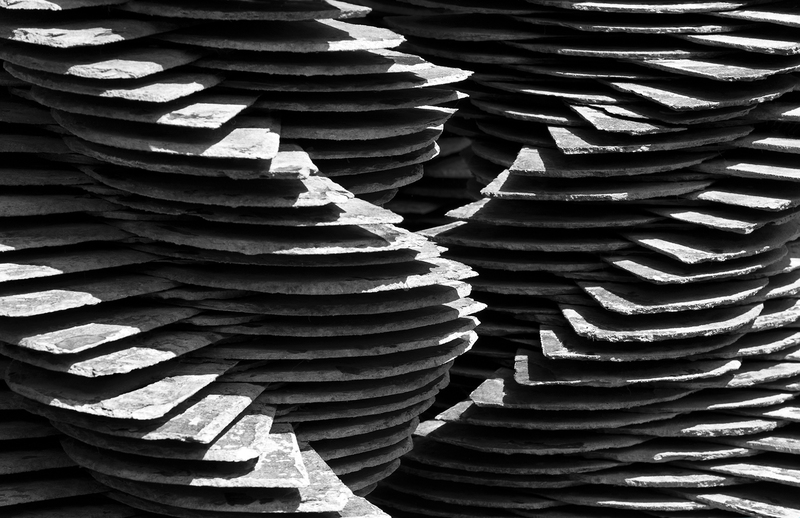 Detail of a sculpture comprising seven pillars of piles of slates. The profusion of layers and the arrangement of the slates are wonderful. I spent nearly an hour looking and studying them. The light – bright, midday sunshine – cast hard shadows that define and separate the slates and augment the idea of profusion. I composed to create opposing diagonals that prevent a jumbled confusion of lines by drawing the elements together. 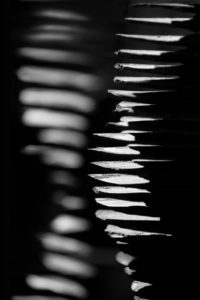 Choice of lenses, use of light, camera settings and how close you can get to your subject are all factors to take into account when composing your abstract image. It’s usually not possible for me to use a tripod or flash. I prefer natural or constant, artificial light, anyway. So I have to work round resulting restrictions. You should consider how best to make use of light, depth of field, angle, and point of focus. A good angle and an appropriate focal point can make or break the flow of a composition. That is especially true with a shallow depth of field. I have discarded many shots owing to poor choice of focal point. I still struggle with it. However, an effective composition is important. So it is worth the effort to get the focal point right. Once you are satisfied with your composition, take a photo, maybe several. It is good to experiment with other settings and angles, you might discover another approach to your subject that is more meaningful to you than your original idea. Abstract image :: “Thorny subject”. I had intended to compose for the spiral created by the arrangement of the leaves of this plant but realised I was more taken with its thorns. I angled to emphasise them whilst, again, looking for a cohesive composition. 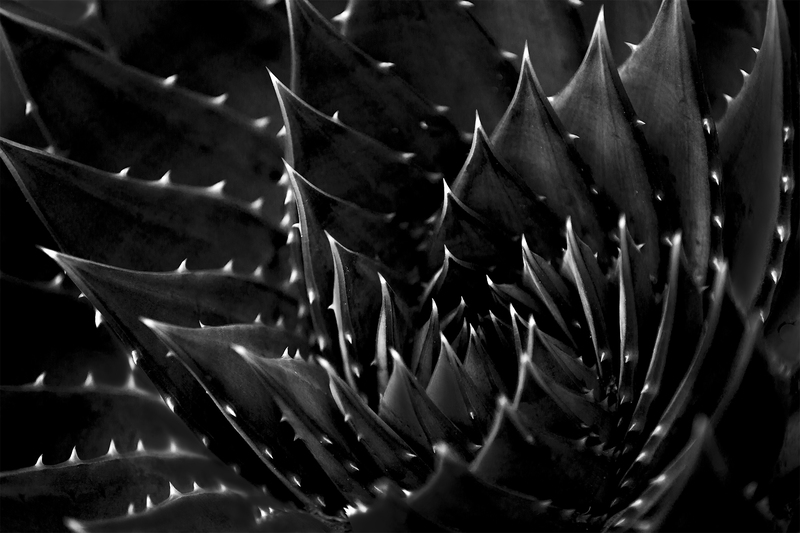 To emphasise the spikiness of the thorns stronger tonal contrasts were created in processing. After you download your photographs, consider and critique them. Take time to do this. Don’t delete a shot straight away; experience might alter your opinion of it. If I am uncertain, I reassess a photo periodically, sometimes processing it, until I feel sure about it. I’m still mulling over a few taken a year or more ago. Got a keeper? Then it’s time to add the finishing touches. Thoughtful processing will take your photograph to another level. How this is achieved is very much a matter of personal taste. I almost always process in black and white. Colour isn’t usually what my images are about. For me it will distract the viewer’s eye from the aesthetic aspects that I want to express, weakening the image’s impact. Other authors may take a different avenue. Final processing is very much a personal style. I often choose to use high tonal contrasts to accentuate, even exaggerate, detail (see Thorny Subject above). My preferred method is to enhance clarity in the image processor’s ‘raw’ filter when developing the image for *.jpg. Then I adjust contrast, brightness and light levels in the main editor. Whatever you do, the aim is to enhance your composition for maximum impact. You should work to help engage viewers with the aesthetics of your subject and give them the best chance of understanding the artistic intent of your image. There are few good books on abstract photography. So this historical view is welcome. It brings together the concepts and the art in abstract photography. Spanning the earliest images to modern processes with quality colour pictures too, the book includes up-to-date work from well known abstract photographers. The book gives readers an all-round view. A macro image and a personal favourite. High contrast wasn’t appropriate here. I love the the way this whelk shell is constructed. The fragility of its exterior (suggested by the light tones) belies the strength of the internal structure, brought out by contrast created with natural, diffused light. On reassessing, I felt the right-hand curve was drawing my eye down out of the frame, so I cropped the bottom of the image to draw the eye back to the pillar. After a day or two, I reassess my image. I take time to let the initial pride of authorship fade. Then, if needed, I do whatever is necessary to improve it. Any processing you want is allowable. It could even mean scrapping the image and starting again. It’s frustrating but not daunting; mistakes are excellent teachers and I want to learn and improve. If that sounds serious, it is. But, it’s seriously tremendous fun. Happy abstraction! Alison Bailey on 365Project.org . Abstract Image :: “Interplay” on 365project.org . Photokonnexion resources on Composition; Photographic composition. Abstract image :: “Rhythmic” on 365Project.org . Abstract Image :: Layers upon layers on 365Project . 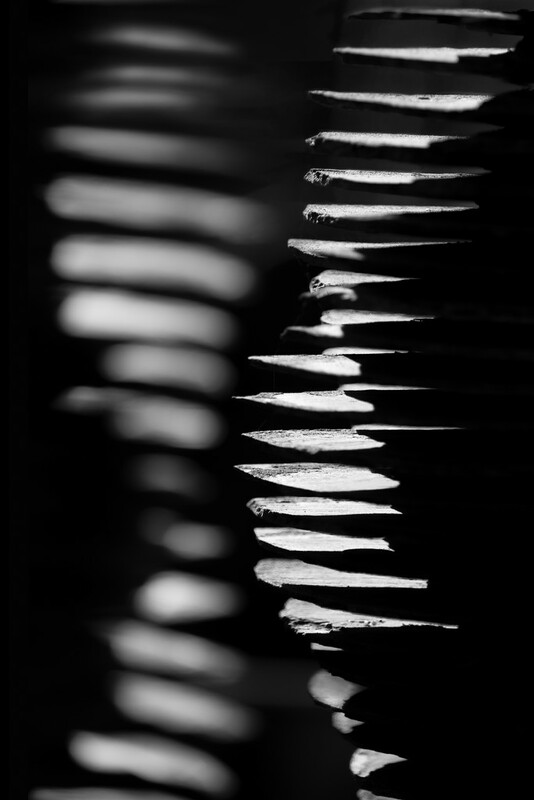 Abstract Image :: “Thorny Subject” on 365Project . Abstract Image :: “Internal structure on 365Project” . Alison is a veteran participant in 365Project.org . She worked as an assistant librarian and a Civil Servant before becoming a traditional housewife and mother. She enjoys life with her retired husband – and her camera. Alison has at last realised that photography is the medium best suited to her artistic abilities. She is having serious fun striving to express, through her images, her love of, and fascination with, the world around her. Abstract photography can produce great pictures and be lots of fun! Concentrate on colour, form, shape and focus for best effect. Two extra dimensions are often found in abstract photography. One is the use of ‘movement’ – mostly through movement-blur. Perhaps, used more often is the use of focus, especially by controlling the depth of field. In addition, abstracts often incorporate “pattern”, which is a more complex structure from the “Principles of Art”. Photo abstracts take the viewer away from knowing or recognizing the subject. Instead they invite the viewer to almost ‘feel’ the textures, forms and other elements of the subject. Often abstract photography makes the object unrecognisable as an object in its own right. Instead it directs attention to the look and feel – the essence of the object. Abstracts are about our creativity and not about the object. 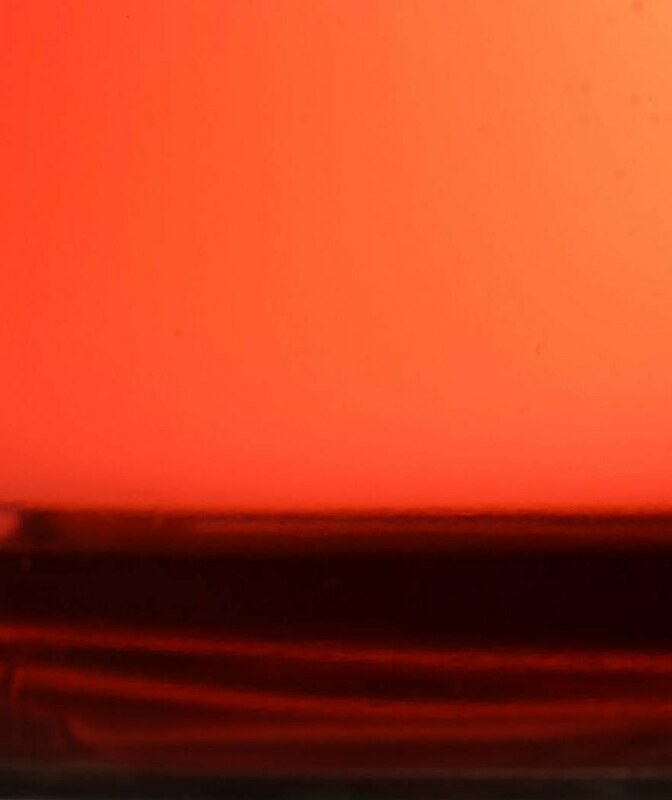 The simple shot above, with its rich emotional orange, is a glass of water coloured with red dye and slightly backlit with a desk lamp. Many abstracts are created using the simplest things – often they are found around the home. 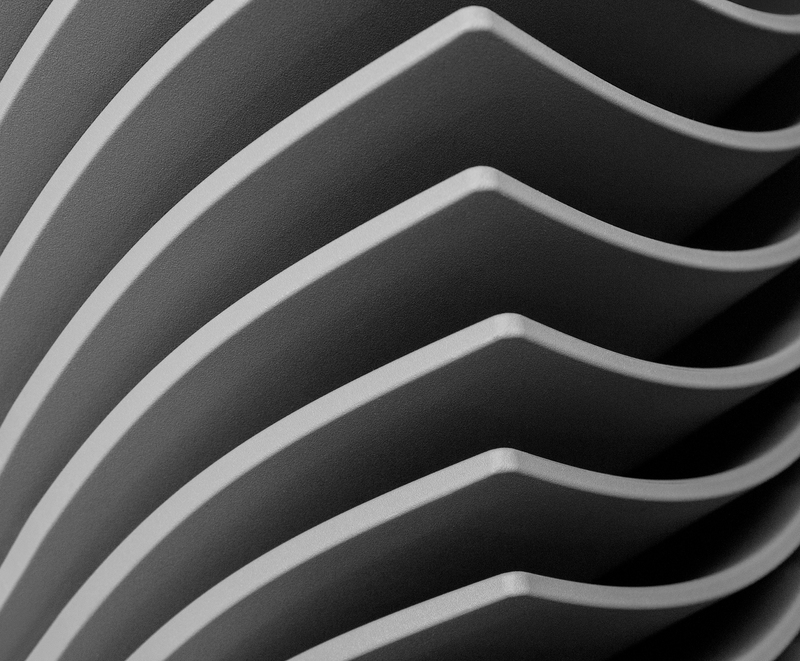 Abstract photography is all about simplicity. Getting down to the basics is often the best route to a good abstract. The list above is perhaps difficult to think about in terms of actually creating an image. However, think carefully about what you see in the frame for your shot. Often you can see these simple elements in your subject. Try to simplify your shot so that you see only one, two, or at most three of those elements. If you manage to get the image to remain simple, you will make the shot more understandable. If you also manage, through that simplicity, to capture the readers eye, you will excite the viewer. Simple components, simple connections, simple insight to a subject – all these give you effective abstract material. Study the Elements of Art, at length. Try to see the simplicity within your frame. That is the key to developing your insight into abstraction. To help you shoot a few abstracts I have put a list of things you can try below. Try one, or a few at a time. Compare them to some of the examples in the links below the list. Reduce or remove clutter. Keep your shot as simple as possible. Look for patterns – especially very close up. Textures – show the ‘feel’ of surfaces and faces of an object. Try unusual or unique angles. Use a macro lens, macro tubes, or get really close. Crop very tight to an interesting/unrecognisable part. Concentrate on multiple colour variations without showing the whole object. Concentrate on tonal variation – minimise colours. Use long, low light exposure to bring out subtle shadow variations. Use soft or hard light variations on close-ups. Emphasis the ‘shape’ (2d) of an object – keep it from being recognised. Exaggerate the ‘form’ (3d) of something – keep it from being recognised. Concentrate on curves and rounded shapes or forms. Concentrate on angular and geometric shapes or forms. Many of these can be applied to everyday objects or common items. Once you become aware of the shapes, forms, patterns and textures in the things around you a new world opens up. So try to take one of the above and spend a few days looking at everything around you for ways to see that item. Then move on to others. Before long you will be an abstract photographer! Composition – Resource pages on Photokonnexion. Abstract Photography – a Definition. Light and Lighting – Resource pages on Photokonnexion. Easy introduction to ‘Visual Elements’ in photographs. Elements of Art (A Glossary entry). Simple ‘Principles’ of photographic composition (A Glossary entry). Principles or Art (A Glossary entry). Definition: Composition (A Glossary entry). Definition: Texture (fine art; photographic composition) (A Glossary entry). See abstract photography examples… . See abstract art examples .